I like the weight because the paper won’t buckle significantly if I soak it with water and, I can incise the surface without worry of cutting though. Another feature of this particular paper is its linen-textured surface. This pattern softened the look of the watercolors I applied. I began by cutting straight lines using a razor guided by the straight edge of a steel ruler. I used an divider (a compass with two metal points) to etch arcs into the paper. With the paper soaked, I introduced different colored inks into the scratched designs. Some of the lines also served as borders, defining colored shapes, others were simply lines (or fuzzy lines, depending on how much ink the scratches absorbed. I like the ambiguity of this piece. It could be a sailboat or a face, or whatever YOU see in it. 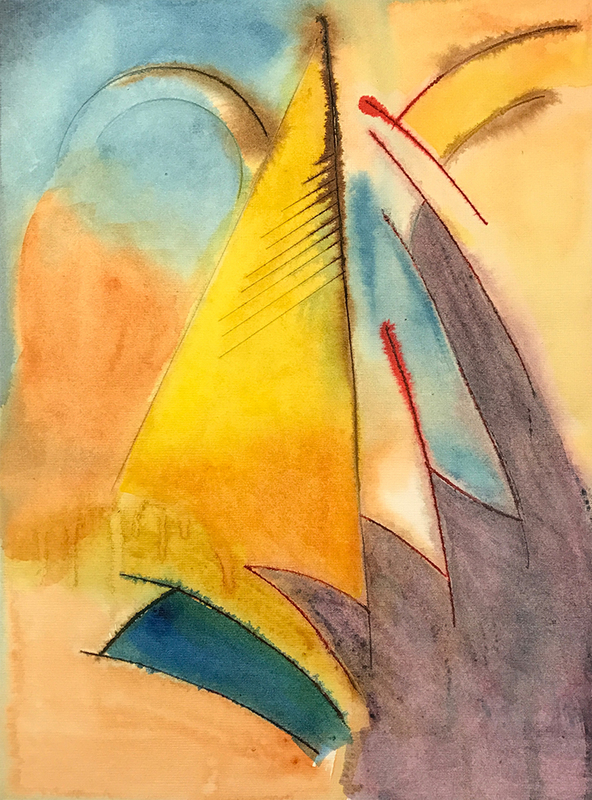 This entry was posted in Personal Stories and tagged abstract art, abstract expressionism, art, artistic process, creative process, etching, linen finish paper, painting, visual arts, watercolor. Bookmark the permalink. I love it! The colors, the shapes. Reminds me of sails. Thanks, Deborah. I thought the same thing too.